This blog post builds upon this Open Borders Action Group post and its comments. Nepal is a small mountainous country, with much of the Himalayas running through it, and is home to some of the world’s tallest peaks, including Mount Everest. It is bounded by China on the north, though the Himalayas form a fairly impenetrable barrier for getting to China by land. it is also bounded by Tibet to the northwest and by India on all other sides. The border between Nepal and India is relatively easy to cross by land (compared with the border with China). GDP (PPP) per capita in Nepal is in the $1300-1500 range, relative to India, where it is in the $3800-4000 range. Thus, GDP estimates suggest that Indians are 2-3X as well off as Nepal. Literacy rate in Nepal is 66% versus 74% for India. The population of Nepal, according to the official 2011 census, is a little over 26 million, or about 2% of the Indian population (over 1.2 billion). The CIA World Factbook from July 2011 estimates the population at a little over 29 million. Nepal-India border is unique in the world in the sense that people of both the countries can cross it from any point, despite the existence of border checkposts at several locations. The number of check posts meant for carrying out bilateral trade is 22. However, only at six transit points out of them, the movement was permitted to nationals of third countries, who require entry and exit visa to cross the border. 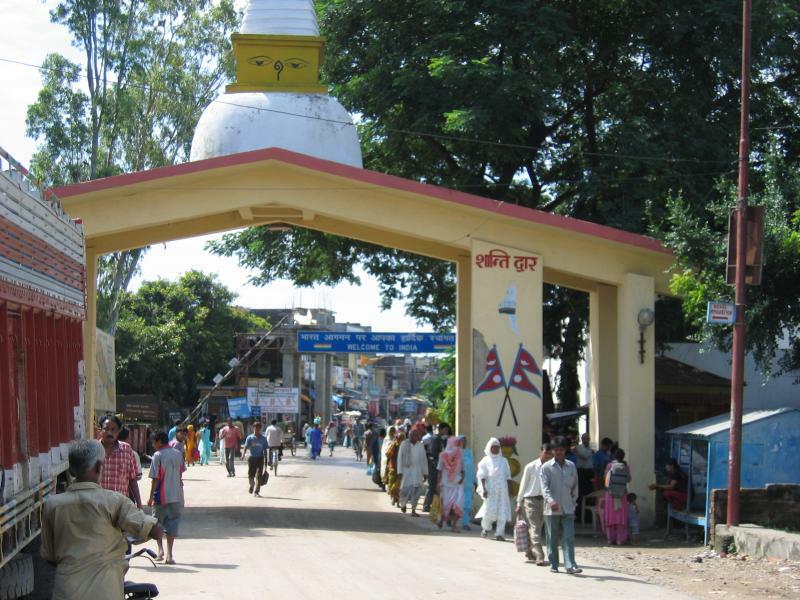 As the whole length of the border except police does not patrol the checkposts or paramilitary or military forces of either country, illegal movement of goods and people is a common feature on both sides of the India-Nepal border. So, the puzzle: given that India has 2-3X the per capita GDP of Nepal and substantially more economic opportunity, and given that the countries have open borders, why hasn’t there been labor market convergence between the countries? Why hasn’t a larger fraction of the Nepalese population moved to India in search of economic opportunity? They don’t count, and are uncounted: No one knows how many Nepalis work in India, nor is there a reliable estimate about how much money they send home by Anurag Acharya, Nepali Times, March 2, 2012. Being Nepali Without Nepal: Reflections on a South Asian Diaspora by Michael Hutt, Chapter Three of the book Nationalism and ethnicity in a Hindu Kingdom. Learning from Nepal’s First Diaspora Bond Issuances by Thomas Probst, Essay on Development Policy. Indians aren’t necessarily welcoming of Nepalese as individuals: attitudes to Nepalese range from welcoming to hostile. But the total size of the Nepalese population is small relative to the Indian population (about 2%, and certainly not more than 3%). So far, nothing terrible has happened in India due to Nepalese migration. Even if the entire country of Nepal were to move over a decade to India, it wouldn’t be noticeable to most Indians. For the most part, therefore, Nepalese migration seems a non-issue. There are a few issues. Smuggling of goods along the border could lead to a tightening of border security, and that might get in the way of peaceful migration. Maoists in Nepal have connections with Maoist-Naxalites in India. This too could lead to tightening of borders for security-related reasons. Overall, however, I don’t expect the open border between the two countries to be closed even in the face of Nepalese migration picking up significantly. This is in sharp contrast with Bangladeshi migration, which has caused a nativist backlash particularly in the state of Assam. Are the GDP numbers reliable? government is a large share of the economy and spends the money on things that people don’t really benefit from. Both problems exist to some extent in India and Nepal, but not to the same extent as they would in a country such as Somalia (the first problem) or North Korea (the second problem). Further, there’s no reason to believe that the figures are unreliable in a direction that would overstate the disparity between the two countries. Better geography: Nepal is covered with mountains that are unsuitable for many economic pursuits. It’s also landlocked. India is geographically diverse, and has large areas of flat plains suitable for agriculture, industry, and dense urban life. Moreover, India has a long coastline with great sea ports. Larger population: Having a larger population allows for a larger diversity of activity and an economy with a greater level of specialization. Historical advantages: The British developed a number of institutions in India that were bequeathed to the Indian government at the time of Indian independence. Even prior to the British, India, though very poor, had a diversity of historical institutions. These historical advantages gave India more growth potential, even if the country failed to realize that potential until very recently. Economic freedom: Economic freedom in Nepal has been somewhat lower than India. According to the Economic Freedom of the World report, Nepal has had economic freedom in the 5-6.5 from 1980 to now, and even though its absolute level of economic freedom has increased, its ranking has fallen, as the rest of the world liberalized and it didn’t. As of 2011, it ranks 125th out of 152 countries with a rating of 6.19/10. Economic freedom in India started out lower than Nepal in the 1970s and 1980s, but with liberalization, overtook Nepal. In 2011, it ranks 111th out of 152 countries with a rating of 6.34/10. The difference isn’t huge, and arguably within the measurement error, but Heritage Foundation’s Index of Freedom reports a similar small gap in India’s favor. This probably accounts for only a small fraction of the economic difference, though. How many Nepalese are there in India? The size of the Nepalese population in India is highly unclear, both due to the fact that migration between the countries is not properly recorded by either, and because of the lack of clarity in definition. Table 3.3 in the Being Nepali Without Nepal chapter estimates that, as of the 1981 Indian census, there were 500,000 Nepal-born people in India, whereas the size of the Nepali community construed more broadly (to include descendants of Nepalese who spoke the Nepali language) may be as large as 2.25 million. Wikipedia claims that there are 4.1 million Nepalese Indians, without citing a source, but the data on the page seems to be taken from the 2003 CIA World Factbook (I cannot find a direct link for the specific claim). If correct, this is a huge increase relative to 1981, and more recent estimates may yield even higher values. The World Bank data for 2010, included in the Migration and Remittances Factbook, states that there are 564,906 Nepalese in India. It’s unclear what to make of these varied figures: the number of Nepal-born in India may be anywhere between 500,000 (~2% of the Nepalese population) to 5 million (~20% of the Nepalese population). The size of the Nepalese diaspora more broadly defined as descendants of Nepalese is probably at least 5 million, though probably not more than 10 million. Indian GDP (PPP) per capita has been modestly higher than Nepal for quite a while, but the difference was fairly small until the Indian economy began liberalizing. As recently as 1992, one data set shows Nepalese GDP (PPP) at $800 per capita and Indian GDP (PPP) as $1200 per capita — hardly a big difference. India’s geographical and historical advantages, and more importantly, its much larger population, have always given it more growth potential, but the potential started getting unleashed only with liberalization measures in the 1990s. This caused the Indian economy to gallop ahead in relative terms, leading to the current situation where Indian GDP (PPP) per capita is $3800-4000 while that in Nepal is $1300-1500. The recency of divergence might explain why Nepal hasn’t caught up with India and also why there aren’t more Nepalese in India: the Nepalese haven’t yet fully adjusted to the knowledge of India being a more attractive destination for economic opportunity. In other words, although India and Nepal have had open borders since forever, the “open borders with a large income disparity” is a relatively recent phenomenon, about as recent as the addition of poorer member states to the European Union. If Indian economic growth continues, we should expect to see Nepalese migration pick up, and I’d also expect that the gap in GDP (PPP) per capita is unlikely to widen beyond the 3X level. Paul Collier’s diaspora dynamics model suggests that migration flows at any given point in time are far less than what either polling data on migration or economic models (such as John Kennan’s) predict. However, if borders have been open for a sufficiently long time, then the fraction of the population with genetic origins in the source country that is in the target country does come close to the high levels suggested by polling data and economic models. Now, Nepal and India have had an open border for quite long, but the recency of divergence suggests that the “open border with huge economic disparity” is a relatively recent phenomenon for the country pair, and the size of the Nepalese diaspora in India at present is not inconsistent with the levels predicted by diaspora dynamics models (I’m just using a crude sense of the numbers and haven’t done any formal quantitative checks). Bihar, one of India’s worst performing states, has a per capita GSDP pretty similar to Nepal’s (emigration from Bihar to the rest of India is significant, though I haven’t compiled quantitative measures). The state has also historically been linked with violence based on caste and class lines. It’s understandable that this is not an attractive target for Nepalese migrants. Uttar Pradesh, one of India’s largest states, with a population of about 200 million (so only four countries have a higher population) has per capita GSDP about half India’s national per capita GDP. Assuming the same PPP adjustment factor, this would put the per capita GSDP at about $1900-2000, somewhat but not significantly more than Nepal. This is not a very attractive target for Nepalese migrants. West Bengal and Uttarakhand have per capita GSDPs fairly close to the Indian average. These states should at least in principle be attractive targets. 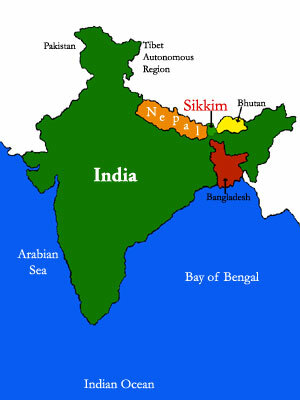 Sikkim has a per capita GSDP about twice the Indian average, but it is a very small state, and India’s least populous. The most recent population estimate (based on the 2011 census) is 610,000, about 0.3% the population of Uttar Pradesh. It is the only state in India with an ethnic Nepali majority. The economy runs largely on agriculture. In recent years, tourism has been promoted. Despite being well-to-do, Sikkim may not offer many job opportunities to facilitate large-scale Nepali migration beyond the level that’s already occurred. (The question of why significant economic disparities between Indian states persist despite internal open borders will be the subject of another blog post). Apart from going to the immediate bordering states, Nepalese also go to other parts of the country, including the major metropolitan cities such as the capital cities, as well as the north-eastern states. But the lack of economic attractiveness of the states very close by could be part of the reason why Nepalese migration isn’t greater in magnitude. Until I looked up the data, I wasn’t aware of the huge GDP (PPP) per capita disparity (I had been aware of the level for India, but not for Nepal). And I’m relatively well-informed about economic matters. Is it possible that many Nepalese simply aren’t aware of, or haven’t given active thought to, the prosperity levels in India? The recency of divergence is important here: information may take time to percolate. Low population density, making it more difficult for information to flow quickly (the population density is actually not all that low — at about 180/km^2, it is in the mid-range, but Nepal doesn’t have dense population concentrations where information flows really quickly)..
Low teledensity (less than 50%) suggesting that information about the outside world and about friends and relatives living abroad may not flow in as quickly and in as much detail as it needs to for people to be inspired to migrate. For comparison, teledensity in India is about 70% and teledensity in First World countries is close to 100%. The following explanations have been posited for why India has an open border with Nepal, with little political resistance to it, yet a lot of unrest over illegal immigration from Bangladesh, despite Nepal being poorer than Bangladesh. Greater cultural similarity propelling more migration: Bangladeshis share close cultural roots with West Bengal (indeed, Bangladesh and West Bengal were both part of the state of Bengal in British India). Thus, there is likely to be much greater migration of Bangladeshis since they may have more confidence they’ll be able to adjust to life in West Bengal. We’ll explore Bangladesh and India more closely in a subsequent post (UPDATE: The post is here). India also has open borders with a very small country called Bhutan (population ~750,000). Bhutan has a much higher GDP (PPP) per capita, somewhere in the $7000 range, but the economy runs largely on tourism, suggesting that it may not scale well with increased population. A large number of Nepalese have migrated (via India) to Bhutan, and Nepalese form a significant minority in Bhutan. Although richer, Bhutan also has more political oppression, so many Bhutanese (including some of Nepalese origin) have sought refuge in Nepal (see here). Open borders within India (part 1) by Vipul Naik. Bangladesh and India: move towards open borders by Vipul Naik. How my day in Wagah led me to rethink borders by Anonymous Blogger. Open borders between hostile nations by Vipul Naik. As far as I understand it, linguistic barriers are rather low. Most people in Nepal speak languages that are related to those spoken in Northern India. If the goal were only to understand others and be understood by them, immigrants from Nepal would seem to face only modest hurdles in this regard. Linguistic barriers and affinities appear to play a role for migration flows in Europe, e.g. Romanians tend to prefer Italy or Spain with languages similar to Romanian over countries like Germany (which makes the current handwringing over supposed mass immigration even more bizarre)..
Just to elaborate your point, not only is the language similar to Hindi (both use same script, Devnagari, btw), most people in Nepal understand Hindi and many can speak Hindi. So, the language barrier is almost zero. There are lot of errors in your essay.the most important omission is that you have mentioned not even one word about us the Indian Gorkhas who speak the same language Nepali but have refused to be Nepali as we r Indians.What does the word Nepali actually stand for please refer to the Statement of Late Girija Prasad Koirala,Nepalese Prime Minster.Business Express a news paper dated December 5 ,1991. Nepali is not a community name like Gorkhas or Bengali or Pubjabior Oriya,Nepali is Nationality name Of Nepali citizens full stop. Nepal and India: an open borders case study is licensed by Vipul Naik under a Creative Commons Attribution 3.0 Unported License.